Oh, sweet Redbar (or Rhodebar). We love the red and white barring, how fitting for any Canadian homestead. A 2 month old cockerel has the patience of an old Rhode Island Red hen and the curiosity of a cat. 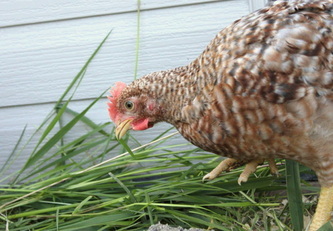 We are pleased to announce we can re-home your cat if you decide to upgrade to this landscaping, bug-eating chicken. This service is free of charge to Canadian residents only. Oddly enough, the young cockerel (60+ days old) shown in the picture above, weighs about as much as that of an old hen. We will be weighing it in another few months as we establish this rarely seen bird into our breeding stock over the next few months. The Rhodebar is synonymous with both the Rhode Island Red and Barred Plymouth Rock breed of chicken. Both are great in their own right. Recently this line has had an upgrade of a utility RIR bred for copious quantities of brown eggs. This bird is not a show bird but it is pretty in its own right. However, you will notice that it is yet another auto sexing breed added to our collection. Like the other auto sexing breeds, it is one of the few available. They were imported, the same as they once were by the University of British Columbia in the 1940's. Numerous attempts were made to establish the Redbar all over the globe. Our own UBC made the fist cross between utility birds of Barred Plymouth Rock and the Rhode Island Reds. Nearing the late 40's they had established the Rhodebar. Ten years later they had finally succeeded at an almost perfect 98% of chicks were auto sexing at one day old. Now almost 70 years later, this heritage bird has returned to the greater Vancouver area. The males are more of a yellow and the females a darker golden hue with eyeliner (seriously) and brown stripes down the back.